A couple of weeks ago, I attended the second edition of new and upcoming club night, Inkarta, an event quite different from your usual Liverpool club night. Characterised by impressive lighting and leftfield, experimental electronic music, it was mesmerising and baffling in equal measure to its audience. When I asked a few attendees what they thought, I say with no exaggeration that at least four of them said something along the lines of, “It’s very good, but it’s a bit ambient, isn’t it?” Within the current wave of instantly gratifying, hedonistic house music, is ambient becoming a pejorative term for audiences whose primary pursuit is the thrill of the four-to-the-floor beat? Well, considering the growing popularity of Inkarta, audiences may be seeking something a little different after all, and the appearance of ambient veterans The Orb on Saturday night can shed light on why ambient house and techno is a genre still worth caring about. Indeed, opening act, WYWH were just the type of artists who embody contemporary down-tempo electronic music. As one member stood immovable from his keyboard, the other member anxiously bashed an electronic drum set (the presence of a real, physical instrument to evoke a raw sound seems to be a common trend at the moment), producing sounds that submerged blissful warmth with cold industrial clanking. WYMH exemplify the sound of some of the down-tempo artists of today, with increased emphasis on electronic music as contemplative and introspective. And while this may be true of The Orb, they are less in touch with the inner angst of the human mind, than with its meditative relationship with the cosmos. Opening the set with flourishing chords, behind Alex Paterson and Thomas Fehlmann stood a big screen depicting a space tunnel over layered with kaleidoscopic shapes which then bizarrely transitioned into disturbing images of historic war leaders, African tribe masks, dolls’ faces, clown faces and finally scarecrows. The point of this was lost on me, but it was certainly exhilarating, as what followed was 2 hours of psychedelic euphoria. The joy on the faces of early 90s clubbers who had not seen The Orb for 20 years was endearing (I had to smile when I saw a man walk past with a “Shoom” T-shirt) as was the astonishment of younger audience members. In fact, two girls were given tickets for free mere minutes earlier with absolutely no clue as to what they were about to see. Whilst I made clear to these house heads that The Orb are on the ambient side of things, another woman insisted that “hips will still be shaking”, and she was not wrong. 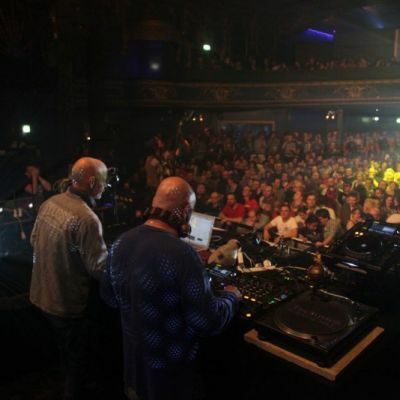 The ‘ambience’ of The Orb’s live sound is more focussed on their soothing backing melodies, but the beat of the set was often relentlessly hard-driving and funky, highlighted by the exceptional Orbital remix of ‘A Huge Ever Growing Pulsating Brain That Rules from the Centre of the Ultraworld.’ The introduction to this track is quite simply, one of the greatest opening few minutes of any track in dance music history, and to hear it live was an absolute pleasure. As the audience howled along to a sample of Minnie Riperton’s eerie yet yearning vocals of ‘Loving You’, it was inevitable that bedlam would ensue as soon as the signature hook creeped its way in. Other highlights included ‘Towers of Dub’ which sounded much more piercing and percussive live than in its studio form, and ‘Blue Room’ which infrequently teased its audience with its recognisable “ah ooh wah wah ooh waah ooh wah wah” vocals. As expected, they finished things off with their biggest hit, ‘Little Fluffy Clouds’ although the virtual absence of the Rickie Lee Jones sample (probably the only ‘lyrics’ which I am able to speak along to) was disappointing. Nonetheless, The Orb are masters at showcasing their limitless array of influences, from Eno to post-punk, prog rock to acid house, Pink Floyd to the dub music of recent collaborator, Lee Scratch Perry; their mantra of love and spiritualism alongside their grandiose, colourful imagery is a far cry from the sterility of the Boiler Room generation. Whilst they could be, and have been, accused of an elitism characteristic of those under the IDM label due in large part to this enormity of musical knowledge, the absence of nodding and chin-stroking among audience members in place of uninhibited fun implied the contrary and whatever their intentions, they put on a damned good show.